We offer a wide range of extra-curricular activities and our school hall is always buzzing each afternoon with team games, netball, football, archaeology, gardening, hip-hop dance or anything else you can think of! Photos of our Integrated Schools Gaelic Football blitz held at Carryduff GAC at the end of last month. Tuesday 21st March marked the end of our first maths club. Boys and girls from P5 attended this club for 7 weeks. For the last week we invited parents to come along and try out some of our activities. We even had some delicious cakes and buns. Having a chat with some of the parents they commented on how far their children have come on after attending the club and one of their daughters is now obsessed with time they had to buy them a digital clock for their bedroom. This club will start up again in a few weeks for another group of P5 pupils. We promise it is not like your normal maths lessons… exciting things happen… but you have to come along to find out!! If you feel you would be interested in attending this club next term please see Miss Davis or Mrs Watson for more details. This is an event which was to raise awareness of Belfast hosting the UEFA U19 Woman’s European Football championships this summer. We had girls participating from P5-7. In culture club we practise and develop our reading skills, writing skills, grammar and vocabulary, as well as speaking and listening skills. We have fun by learning through games, art, drama, ICT, cookery and role-play. I am improving my drawing and writing. We make lots of fun stuff. Culture Club is a fun place to be. I am not alone and it's a good way to make friends. I love Culture club because it lets me be me. I get to do my favourite things and learn and that lets my brain work. It makes me feel happy and excited. I like to go to Culture Club it is fun and we play. We also learn and have fun and that makes me happy and that's why I go to Culture Club. I like being at Culture Club because my two best friends are there and we draw, write and learn in Culture Club. We also cook and go on trips. Me and my friends always laugh together and have fun. Next week we are making pancakes! Culture Club is fun because you get to draw. It is great! Culture Club is fun! You are never sad, always happy! Over the past few weeks in culture club the children have been working with money. They have been roleplaying shopkeeper and customer and practising the language needed in those situations, as well as the essential skills of adding amounts and finding change. They put what they have practised into action during a trip to a local shop. Here are some photos of the netball team who are ably led by Miss Davis and our friend who comes to training and helps out every week. There is a tournament in our school on Tuesday 24th January 2017 2:30 – 4:00pm. We are playing against Fairview, Templepatrick and Kings Park. Here are a few P7 girls modelling the new netball kits. The girls raised money for these before Easter with a very successful bake sale. Can't wait to wear these to the tournament. Here are photos of the P7’s Cookery Club. They were decorating gingerbread men for halloween. they made them into skeletons and zombies! Pictures of work from the ICT Club. The children learnt how to take photos using the Ipad and inserted these into a programme called Pic Collage. The pupls then enjoyed adding different styles of text and borders to complete their pictures. This club is for P6 and P7 children and meets on a Friday during 'clubs'time. This takes place on Thursday afternoons for P6 and P7 children. at 3.00pm. It is run by Mrs. Breslin. This is a peer counselling group for children who have suffered loss due to separation of their parents or a family bereavement. The teachers involved this year are Mrs Blair, Mrs Anderson, Mrs Acheson and Mrs Douglas. Monkeynastix is a fun, exciting primary movement programme, developing core skills and balance. This takes place every Thursday from 2.00-3.00pm for Primary 3. 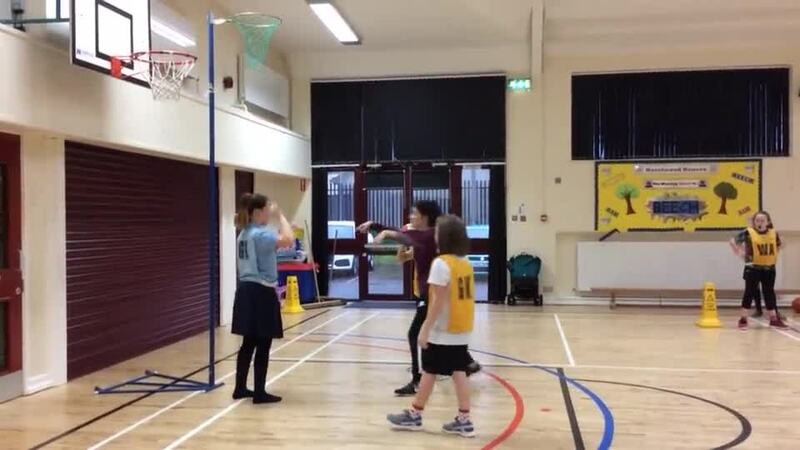 Netball takes place in the school hall on Tuesdays from 3.00-4.00pm for P6 and P7 girls. Gardening club takes place on Wednesday (in the Spring term) from 3.00-4.00pm with Miss Agnew. This will start in March and is for P6 pupils. Read more about gardening club on our Eco-Schools section under 'Curriculum'. Modern dance will begin soon on Wednesdays 3-4pm. The class is for Primary 6 and Primary 7. Mrs Watson leads this very successful club on Thursdays from 3-4pm. This term the club will be for the Primary 5 classes. Miss McCarron will take a Gaelic club for P6/7 after our Easter Break. Mrs Blair will be taking a cycling proficiency club in the summer term with P6 on Tuesday afternoons.